It started as a blue-collar sports car. The Mk 5 was superb but the latest Golf GTI is truly astonishing, writes Thomas Falkiner of The Times Za. If there was an award for the most politically correct car, it would probably be handed to the legendary Volkswagen Golf GTI. A snappy performance hatchback, born classless and strangely free from the elitism that usually manifests itself in machines of such superior stature, the Golf GTI is the original auto diplomat; an everyday motoring icon with an uncanny ability to hit home with an unbelievably wide spectrum of petrolheads. Seriously, whether you’re a bling- packing wheeler-dealer from the Cape Flats, a black-diamond businessman with a taste for tailored suits or a peroxided brawler from the bad side of Boksburg, those three letters — GTI — shatter the cultural divide and stir up driving hopes and aspirations. It’s an impressive automotive feat that’s long been imitated by many of VW’s rivals and, more importantly, one that’s been going strong since the spirited original upset the motoring status quo back in 1976. HERNDON, Va. – Volkswagen of America’s top executives outlined a strategy today to turn the European automaker’s money-losing U.S. arm into a pillar of its plans to surpass Toyota Motor Co. as the world’s largest – and most profitable – automaker writes DETROIT FREE PRESS. With a goal of selling 800,000 VWs in the United States by 2018 – a threefold increase from this year’s levels – the automaker will add several new models designed specifically for American buyers, including a new sedan, a seven-seat sport utility and an updated version of its iconic Beetle. And instead of importing most of its models from Europe, where currency fluctuations have left the company losing billions in North America, its high-volume vehicles will be built in the United States or Mexico, with parts from nearby suppliers. VW is spending $1 billion to build a plant in Chattanooga, Tenn., that will launch a new midsize sedan in 2011. Stefan Jacoby, VW’s North American chief, said the model will be larger than the current Passat but cost less – targeting the Honda Accord, Chevrolet Malibu and Toyota Camry head-on. VW executives said the company would refresh its entire lineup by 2011, and would target new parts of the market to boost its sales. That includes building some kind of seven-passenger SUV to compete against the Honda Pilot, Toyota Highlander and Chevrolet Traverse. VW has a large SUV, the Touraeg, that can carry a sticker price of more than $60,000. Jacoby said the company also would bring a new Jetta and Beetle in the next couple of years with updates that reflect American tastes more than the current models. He said the company was making progress on improving quality, which has lagged Asian and American competitors in the past. He also said the company would consider smaller models, but would not chase parts of the market such as pickups where VW couldn’t stand out. “It’s not our intention to make VW a boring brand,” he said. Jacoby declined to say what else VW might build in Chattanooga besides the new sedan, but executives said the automaker would need to add models there and likely build new engine plant somewhere in North America to make its plans for growth. Contact JUSTIN HYDE: 202-906-8204 or [email protected]. VW Seeks to Turn Nostalgia Into Sales in U.S.
FRANKFURT — It is nice to be an iconic automobile brand in the United States. But as Volkswagen knows better than most carmakers, it’s even nicer to actually sell cars. 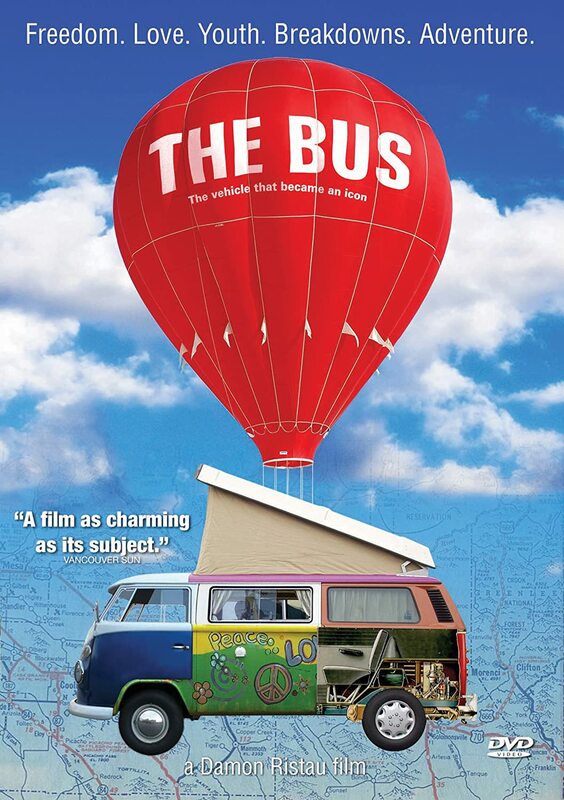 While the rare old VW bus or vintage Beetle can be spotted chugging down the byways of America, nostalgia doesn’t pay the bills. Mr. Jacoby is trying to change that. As baby boomers reminisce about the summer of Woodstock 40 years later, he is trying to devise a future for a brand in the largest automobile market in the world, at a time when many Americans associate VW more with the past than the present. A peek at the game’s expanded car editor. by Matt Casamassina of IGN. 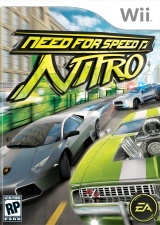 US, August 21, 2009 – Electronic Arts debuted a new playable version of Need For Speed Nitro at Gamescom in Cologne, Germany this week. The Wii-exclusive racer is designed as a more arcade-y take on the license, whilst the PlayStation 3 / Xbox 360 project, Shift, is geared a little more toward those with a penchant for simulation races. I’ve played and previewed NFS Nitro several times in the past and also interviewed the development team behind it. A new level, Rio de Janeiro, was on display and I took it for a test drive. If you’ve read any of my other write-ups, you will already know this, but Nitro is really fast. It zooms along at a Burnout pace and runs at a constant 60 frames per second — the first time ever a game in the series has achieved that blazing momentum, which is kind of ironic given the name of the license in question. You can play it any way you like — nunchuk and Wii remote, controller on its side, etc. — but actually, I’ve grown fond of an unconventional alternative that the development itself prefers, too. I simply hold the Wii remote normally, steer by twisting left and right (as you would a key in lock), gain speed by pressing the A button and take drifts by tapping on the B-trigger as I round corners. You might think it sounds weird to control the game one-handed using only the ii remote, but it actually feels very good; there’s something very tangible and satisfying about steering by twisting like that. Of course, the biggest new addition on display since I last played Nitro was the car show room and the ability to fully customize your favorite vehicles. To demonstrate, EA pulled out a tricked-out VW Beetle, loaded it into the editor and began tooling around. It could bring up a series of Photoshop-like paint brushes and decals, which could intuitively be applied to the car. Twisting the controller would in turn rotate the decals, and they could also be easily sized up or down. In addition, the bodies of the vehicles could be fully painted different colors. All in all, the feature seems well thought out and I’m looking forward to exploring it more thoroughly. The Mission: Midwestern uncles expose their So-Cal nephews to the natural wonders of whitewater rafting and camping amidst the bugs and bears. The Machine: The obvious eco-sensitive option for five folks on such a mission is a minivan, and Volkswagen has the latest entry in the segment, with its if-you-can’t-beat-em-join-em Routan by Chrysler. Writes Frank Marcus of MotorTrend. VW’s Routan is assembled alongside the Dodge Caravan and Chrysler Town & Country, but the visual differentiation is thorough inside and out — even the rear quarter-glass is unique. Much of what’s new is great — the styling is more appealing, the soft-touch interior materials more plush — while other revisions seem retrograde. The second-row captain’s chairs are comfy, but difficult to flip forward (be sure the headrests are fully down), after which the entryway to the rear is slim. On the plus side, they pop in and out fairly easily to serve as superb campfire thrones. The front seats offer great lateral support (not that it’s needed), but the side bolsters get in the way when climbing in or out. And the motorized third-row seat (part of a $2385 package) is convenient, but shifting luggage pressed the button once, collapsing the seat on its startled occupant while parked. The suspension is also retuned, and without a full load aboard the ride feels flinty around town. I’m not sure anybody wants to carve corners in a minivan even when it’s empty, so these starchy suspenders seem about as out of place as Air Jordans on Oprah. The huge in-floor storage bins are a superb place to stash in-car games and fragile, crushable stuff picked up along the way. Chrysler’s UConnect Bluetooth system is a cinch to set up and use, as is the rest of the nav/sound system ($2475), though we wish the map readout could be larger and that a USB device could be operated on the fly (the USB jack is only for downloading music). As we started packing for the big journey, it quickly became clear that five people, their carryon luggage, sleeping bags, air-mattresses, folding chairs, tents, screen-house, stove, five-day cooler, and myriad amusements (okay, we’re not totally roughing it) were never going to fit inside without obliterating the rear view with avalanche-prone stacks of stuff. Fortunately our Routan came equipped with a roof rack and easily adjustable crossbars (a $785 option on the base Routan S, it was part of that $2385 package on our SEL), so I bought a $30 canvas car-top carrier for the camping gear — the best investment of the trip. Our three nights of camping were all rainy, but the sun shone during our four-hour rafting adventure on the Lower Youghiogheny river, during which our Laurel River Highlands guide “Sarge” had the pleasure of pulling the experienced uncles and sis out of the river at various points, while the neophyte nephews remained dry. We truly got our money’s worth out of that car-top carrier when it happily swallowed up the river-drenched swimwear and sodden tents, sparing us untold olfactory unpleasantness for the drive to the next four attractions: Frank Lloyd Wright’s Falling Water, the Pro Football Hall of Fame, Cedar Point, and Toledo’s famous Tony Packo’s restaurant. Our 4.0-liter V-6 had no trouble shouldering its load and returned 21.0 mpg for the 1250-mile trip, an impressive result given that we were loaded to the max gross vehicle weight rating with the aerodynamic compromise of that rooftop carrier. A few of the donor platform’s shortcomings shone through, however: The brakes are underdesigned and the fronts were pulsing badly whenever the rotors got heated up, and the transmission occasionally lurched or jerked a bit at low speeds. Still, there’s no beating the basic idea of a minivan for a family vacation, and this Chrysler-Dodge-VW design has a lot to recommend it. Odds are if you are under 40 yrs, you have never even heard of a Chevy Corvair as they stopped making them in 1969, writes www.examiner.com. Some 20-30 year old somethings think they are a Japanese car. If you were a kid in the mid to late 60’s, you probably know about them. You probably still love the body style, sporty and sleek, they are just cool looking. If you have never seen one, you will probably also agree with that observation. Even today’s tweenies (10-14 yrs) love them, especially the convertible! Corvairs are known as the “poor man’s” collectible car. They usually range from $1000 to $8000, over 1.5 million were made. Most are either on craigslist or Ebay. Parts for restoration are not an issue at all. Several places on the East and West Coast sell only corvair parts. There are plenty of books about them. There are probably still over 80,000 of them in the US. Owning a Corvair is an experience. It usually is a love\hate relationship. You love the car when its running great and looking good, then, hating it when you buy a costly part and unable to install it because of rust. The car is a time machine (well, any old car is) in that it makes one realize how far car technology has come in 40+ years. Until you sit and drive one, it is hard to differentiate the obvious and subtle differences. As a kid, I had always thought that the 60s cars were sophisticated machines. They were for their time, but driving a car made today (or since the 90s) and driving a Corvair is like night and day. The most noticeable item is the near all metal dash, more strength is needed to steer the car, thicker body metal, more chome. With older cars, you hear the engine, so they are more noisier. The Corvair was the economy car for Chevy, yet, it is as big as many of today’s cars! The Corvair is low to the ground, comes with either 2 or 4 carbs that need to be synchronized in air flow and idle\fuel mix. The engines are simple yet temperamental. Settings must be close to specifications or it will not run correctly, even for these more primitive engines. Another thing, as a Corvair owner, always carry some tools and a spare fan belt. A Hayward, Calif., man in 1972 paid the sticker price of $2,224 for a brand new Volkswagen Super Beetle because, in those days, there was no negotiating on Volkswagens. Then just one year later in 1973, John Morrissey’s father bought the slightly used Beetle for his college-bound daughter, writes The Washington Times. 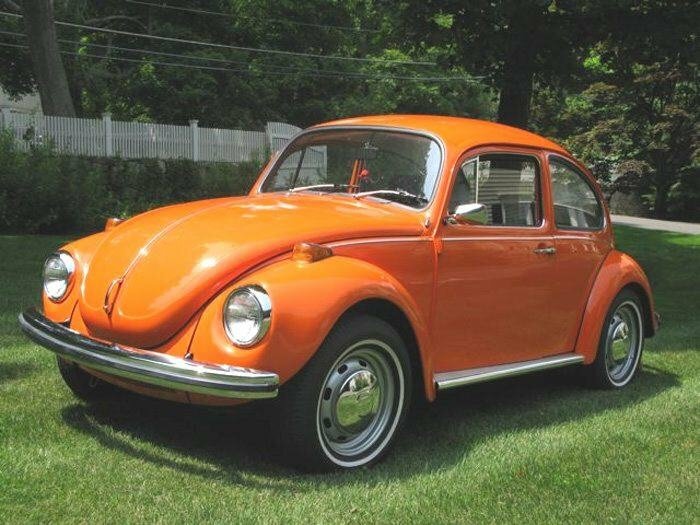 Even though the orange-colored Volkswagen had an air-cooled, four-cylinder engine that delivered 60 horsepower, she wanted something “a little more sophisticated.” That is how John inherited the car from his sister, which he drove until he graduated from high school in 1975 and then through his years at the University of California at Berkeley. “It was me,” he says. He learned the intricacies of driving a manual transmission on the VW. Twenty-five years passed, and Morrissey now resides in Ridgefield, Conn. He has stayed in touch with his California buddy and asked him if his mom still had the VW. Mr. Morrissey was told that she sold the car “years ago,” but that he would attempt to learn the fate of the 1972 Beetle. On sale—A slice of history for Rs 20 lakh apiece. The Volkswagen Beetle, the world’s longest running and most-produced car of a single design, will be available in India in three months, offering a Nano-sized ride with the frills of a top-notch SUV writes businessweek.com. The car that has meant various things to various people—once the quasiofficial vehicle of Germany’s hated Third Reich in the 1940s, the Beetle went on to become the darling of California beatniks in the Swinging 60s—is being imported as a completely built unit from its Mexico plant, and is currently undergoing technical testing ahead of its India launch. Its hefty price tag, which pitches it in the luxury car segment alongside Honda Accord, Toyota Camry, Skoda Superb and the MercedesBenz C Class, is due to the 110% import duty and high safety specifications. The Indian unit of Volkswagen said pricing the Beetle competitively was a big challenge for the company and blamed taxes and logistics for the high price. “But we are working very aggressively on Beetle’s debut in India,” said Neeraj Garg, Volkswagen India’s director for passenger cars. The German carmaker, now owned by Porsche Automobile, which already sells the Passat and Jetta models in India, expects the Beetle to have a product segmentation of its own and instead of competing with other imported smaller hatchbacks, most notably the Fiat 500, which costs Rs 15 lakh exshowroom price in Delhi. Also known as Bug, the Beetle will sport a 1.9-litre TDI diesel engine and a 5-speed manual transmission. Its other features will include rain sensors and cruise control, along with acoustic rear parking sensors to fit into small parking spaces. Its safety features will include ABS, traction control, anti-skid system and standard front and side airbags. Mr. Garg said Volkswagen was not looking at high volumes but hoped to leverage its brand value before launching its mass-market Polo hatchback, expected to debut sometime later this year. Fiat’s model 500, (also called the Cinquecento) launched last year, has managed to sell just 58 units to date. “We are expecting a much better response for the Beetle, which carries a very high iconic value,” Mr. Garg said. Volkswagen’s decision to launch the Beetle comes at a time when rival BMW has put on hold its plan to launch the equally iconic small car Mini in India. BMW, which does not see it as a viable proposition yet, has pushed back the India rollout of Mini beyond 2010 and will continue to focus on bigger sedans and sports utility vehicles for now. • Hefty price tag due to 110% import duty & high safety specifications. • To have 1.9-litre TDI diesel engine and 5-speed manual transmission. • Features include rain sensors, cruise control, acoustic rear parking sensors. Volkswagen’s long-term hopes to become the world’s No. 1-selling automaker include a sales goal of no less than 1 million units annually for Audi and VW combined in the United States by 2018 writes bnet. That’s far more than VW has ever sold in the U.S. market, even in the heyday of the first Volkswagen Beetle. Nor does that sales goal include Porsche. VW is in the process of acquiring Porsche. Nor does it include VW’s other global brands, like Bentley. All told, that spells well over 1 million units per year in the United States, including 800,000 per year for the Volkswagen brand, and 200,000 per year for the Audi brand. VW calls its master plan “Mach 18,” for 2018. VW started talking about 800,000 units annually in the United States after it confirmed that it will build a $1 billion factory in Chattanooga, Tenn., with an initial annual output of 150,000 units a year, starting in 2011. In interviews, Volkswagen of America executives had gotten a little artfully vague about that 800,000 goal, for instance whether it included all of North America or just the United States, and whether that was the goal for all VW Group brands, or just the Volkswagen brand. 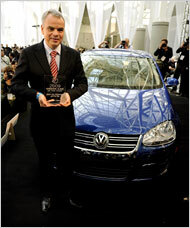 But Stefan Jacoby, president and CEO of Volkswagen of America, reiterated the goal of 800,000 for VW at a New York auto show press conference in April 2009. “We will not waver from this goal one inch,” despite the U.S. recession, he said. Then in June 2009, Don Jackson, president of VW’s Chattanooga production facility, said in a presentation sponsored by Automotive News that the Mach 18 plan calls for 800,000 for VW and 200,000 for Audi. Recently, with General Motors just out of bankruptcy and Toyota also retrenching, Volkswagen has started doing the math for what it would take to become No. 1. For the first time since the 1960s, the United States is becoming a much more important part of that mix. 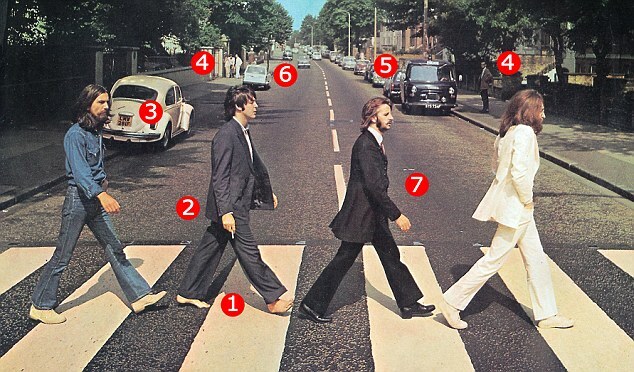 Forty years ago, at 11.35am on August 8th, The Beatles walked across a zebra crossing in an innocuous North London street. The photoshoot for their new Abbey Road album happened just yards from the eponymous recording studios and took ten minutes – only six frames were taken by the photographer, Iain Macmillan, who was perched on a stepladder writes The Mail Online. It has since become one of the most iconic covers in history for two reasons – no album cover has inspired more imitations, and none has spawned such a mass of conspiracy theories. For Beatles obsessives with fevered imaginations, it was ultimate proof of the bizarre theory of the time – that Paul McCartney was, in fact, dead.